Five years ago next month, we opened C2C Gallery. It began with the idea of selling my ceramic work and helping other area artists promote their artwork too. Linda Ippel connected me with three area artists – Don Prys, Jodi Steen, and Jack Hillman. Jack called me, introducing himself, and asked if he could schedule a time to meet. Our friendship began from that first phone call. He was that kind of person – always humble, kind, interested in what you were doing, and always wanting to learn more. Jack was my first artist in a summer series called “Artist at Work”. We organized five different events where artists creating in different mediums would work for several hours on a Saturday afternoon either outside our front door on First Street or inside Harbourfront Place. 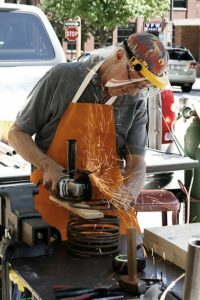 We hosted Jack Hillman, kinetic metal sculptures; Lee Brown, wood and stone totems; Shawn Williams, pastel drawings; Julie Sanford, jewelry fabricating; and myself, throwing on the potter’s wheel. Jack was our first “Artist at Work”. He set up an entire metal workshop right outside our door. He torched metal, bent it, and soldered it. It was fun to watch. My daughter and nephew walked up and down Washington Avenue promoting Jack working in metal. Bob Walma created a video of him working on that Saturday in July of 2011. Thinking back on the day, I remember being hot, hoping for a good visitor turn out, and being so very grateful to this artist and his wife, Cheryl. There is a poem that sums up Jack’s view of his world. I found it on his website. I thought I would share it. Jack died Friday evening, April 8, 2016 from pancreatic cancer. Cancer is such an ugly disease. I am still stunned that I won’t see or talk with him again. He will be missed by many. Thoughts keep circling in my head about Jack’s quiet questions asking to learn more; his voracious thirst for knowledge; and his willingness to help. 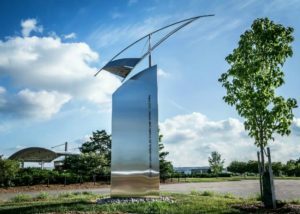 Last year, our downtown area started a new project of hosting public sculpture. Jack was the first artist to contact me. 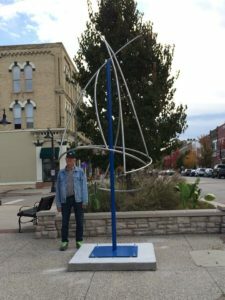 He created a kinetic sculpture just for Grand Haven. He named it “Into the Wind”. 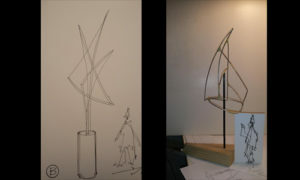 I believe it is the last sculpture that he developed. It has been an honor to know this man. 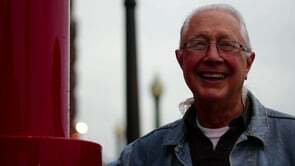 Thank you Jack for being such a gift to me and your community. Installation Video at the Grand Rapids Charter School where Horizon Dreams is installed.